You know what makes me cringe? Cranberry sauce in a can and the sound it makes when it falls out of the can. Blah! But, turkey and cranberry sauce are a must at the Thanksgiving table each year. 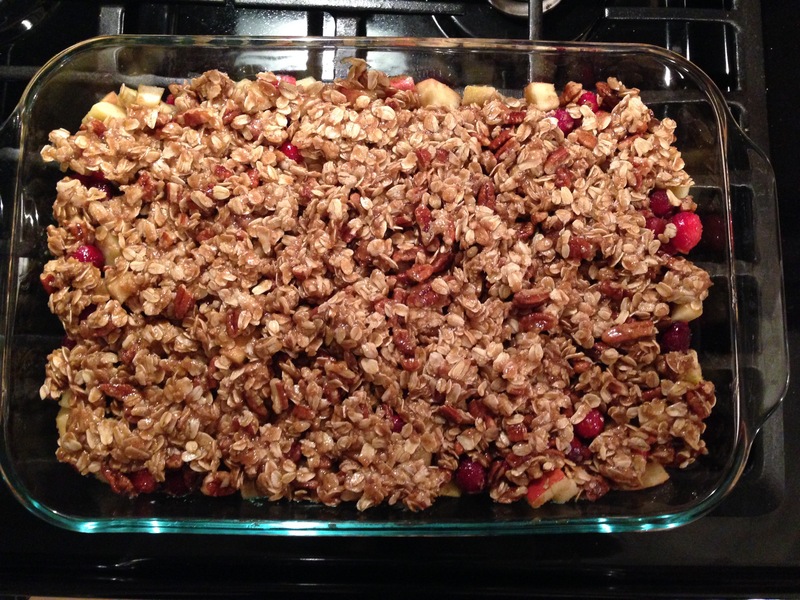 I wanted to put a different spin on the traditional cranberry garnish – introducing Cranberry Apple Crunch! Mix all ingredients in a medium sized bowl and pour into a 9×13 baking dish. If you want a thicker base layer, use a smaller baking dish. Melt butter and mix in all other ingredients. Spread topping mixture on top of the cranberry/apple base layer. Little secret – I double the topping when using a 9×13 baking dish and sometimes throw in extra pecans. More is better with this recipe! Next Post Commercial for Crazy.